The Itinerary: I am Ukraine bound today. My plane leaves Grand Rapids, MI at 6:57 p.m. and I arrive Kiev tomorrow at 4:30 p.m. 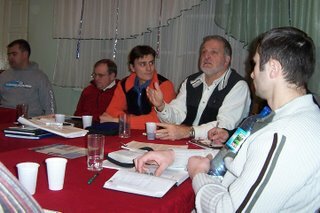 I'll be in Vinnitsa for a 3 day conference next Monday-Wednesday helping equip and encourage young pastoral leaders. I will be teaching three sessions on Jesus the (radical) pastor. I will then travel west to Lutsk and L'viv and work with the brothers and sisters there. On Sunday I'll preach in Calvary Church where Sasha Savich is the pastor. Sasha is in the last picture. I then will travel a little more south to encourage the Hosanna Church team led by Dema in L'viv--a beautiful city in the southwest part of Ukraine, renown for being the first city in Europe to sell coffee to Europeans. I return to Grand Rapids on September 28. Julie and I ask for and deeply appreciate your prayers. Julie will not go with me this trip. However, Julie may post some things here on the blogspot in the next two weeks. The Pictures: The handsome pastor with the tie is Pasha Myronuk of Fimiam Church in Lutsk. 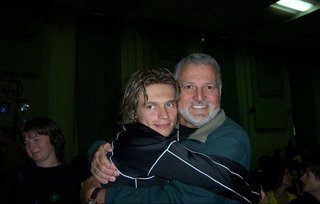 I am giving Andre Uhimetz, pastor of Greenway Church in Vinnitsa, a hug. 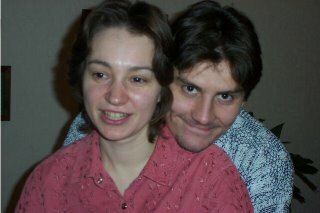 The young man and woman are Maksim and Lena Rakovich who live in Kiev. Maksim is our man of a thousand talents including serving as guide, chauffeur and interpreter. One picture shows me carrying on about some topic of great interest. Thanks for your prayers. 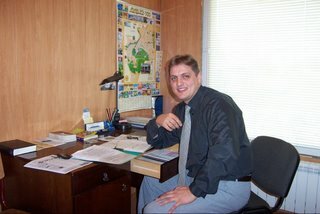 I am sad to miss Scot's teaching at the Seminary. Please say "Hi" to him for me. 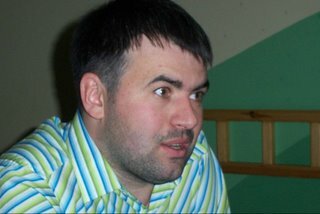 I just returned from Vinnitsa. I have been there 18 times. I'm surprised we never ran into one another. What are your connections with Vinnitsa? Our church helped build the large church. Is that were you were training pastors?